Manny Pacquiao is trying his hands at politics during a run for a Senate seat as a conservative in the Philippines. 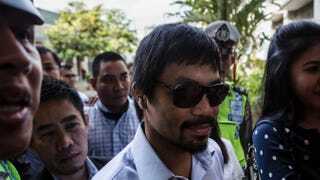 Pacquiao, who has made homophobic comments in the past, doubled down on them during a recent interview. Floyd Mayweather weighed in on Pacquiao’s comments and disagreed with his biggest rival. "We should let people live their lives the way they want to live their lives. To each his own," Mayweather told TMZ. Pacquiao said that his comments are common sense, but now he’s apologizing for his definition of common sense. Pacquiao, I’m sure no one wants your prayers.